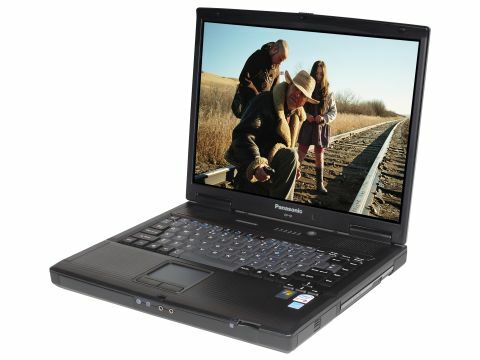 Few manufacturers can match Panasonic and its Toughbook range when it comes to strength, so if you're looking for a laptop able to withstand virtually any conditions, the semi-ruggedised Panasonic Toughbook CF-51 could be an option. It's aimed at corporate users wanting something a little more robust than the average laptop. It can be dropped from 30cm without damage to the hard drive or display, thanks to the use of magnesium throughout the chassis. The 80GB hard drive is also attached to the chassis using foam which acts as a shock absorber. The rear of the screen is also constructed from magnesium for greater protection. In a bid to prevent dust and dirt getting into the CF-51, Panasonic has abandoned the traditional air vents found on most laptops in favour of a sealed unit. The display is a 15-inch standard TFT panel, which is bright and clear. It has a native resolution of 1,024 x 768 pixels (XGA), which offers just enough room for working with multiple windows. As expected of a corporate machine, the Panasonic features an integrated graphics card: Intel's 945GM chipset. Although it doesn't offer much in the way of multimedia ability, it's ideal for office tasks, as borne out by a 3DMark 2003 score of 1,227 points. Battery life also benefits from the use of an integrated GPU - the CF-51 ran for an impressive 376 minutes, under test conditions. Processing power comes courtesy of an Intel Core Duo T2300 chip. Although not the most powerful of Core Duo processors, at 1.66GHz it's more than adequate for day-to-day tasks. Memory is kept to a minimum, with just 512MB of DDR2 SDRAM. Despite this, we found the CF-51 loaded applications quickly, although a slight lag was apparent when running several simultaneously. This was highlighted in the below-average MobileMark 2005 score of 198. When it comes to connectivity, the CF-51 has all the features expected of a corporate machine. Gigabit Ethernet is in place for the fastest possible fixed network connections, and 802.11a/b/g Wi-Fi lets you take advantage of wireless hotspots. S-Video and VGA-out ports enable connection to projectors and external monitors, and you'll also find a serial port and two PC Card slots. Unfortunately, while the DVD/CD-RW optical drive will read DVDs and burn CDs, it doesn't offer the ability to write to DVD.